When it comes to making a weekday lunch, I don’t want a big production. I’m working, I’m hungry and I’m more likely to eat crackers and a Granny Smith apple than to actually make something from scratch. But today I made something that was easy, fast and super yummy. I had a bottle of my favorite dressing in the fridge (but you could certainly make your own from scratch as I’ve done many times in the past) and a can of tuna in the cupboard. Lunch seemed simple. A little of this, a dollop of that and lunch was ready to eat in no time flat. I actually thought that I had bought a bag of peeled edamame, but when I checked the freezer I realized I had accidentally purchased broad beans. Oh well, they worked wonderfully with the corn and pasta here and the dressing adds a nice little kick. 1. Prepare pasta as directed. During the last few minutes of cooking, throw in the frozen beans and corn. Drain pasta and vegetables and rinse with cold water. 2. Put into large bowl and add in tuna, onions and green pepper. Pour in enough dressing to coat the pasta making sure not to over do it! Grind in some pepper and chill at least 1 hr in the fridge…as if! Or eat after 5 minutes like I did. I love Annie’s Green Goddess dressing. Sounds like a tasty lunch. There’s no way I could wait for it to cool! I love quick salads for lunch, too! Joanne – another variation is on this is using a can of garbanzo beans instead of pasta – perhaps your husband would like that? I often make a quick lunch salad that is garbanzos, leftover roasted asparagus, a can of tuna, and Annie’s Gingerly Vinagrette. What a delicious combination of flavors! 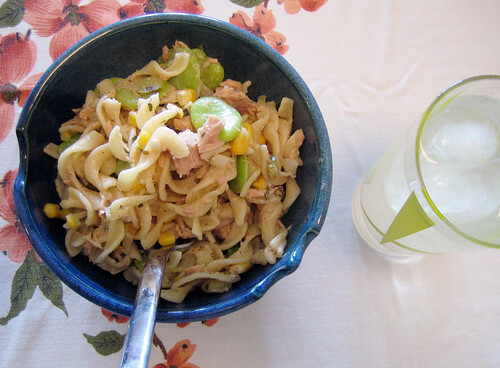 I love tuna with pasta and the addition of beans and corn is a very interesting twist. Maija, great idea of using chickpeas instead of pasta! I’ve never tried the Gingerly dressing…something I think I’ll do next time I shop. Thanks Patricia! This really works well and it’s so easy to whip together. Nope he doesn’t like pasta but he’s also diabetic and so out of necessity cannot consume carbs the way average folks can. Protein is a must in his diet. I tell you, he loves his meat! Maija thanks for the tip. My husband does enjoy dried beans on occassion and garbanzos are one of his favourites.